The Adams is a beautiful two-story home that boasts a finished floor area of 1,843 square feet and has a total space of 2,712 square feet. Its main floor comes with a porch and a spacious garage. Upon entering the home, you’ll be greeted by a roomy entryway that connects to the expansive great room, dining area, and kitchen. The upper floor, on the other hand, is where you can find 2 bedrooms and a bathroom. 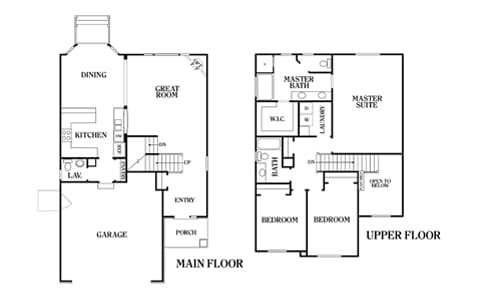 This is also where the master suite that comes with its own master bath and walk-in closet is located. If you’re looking for a company to help you create your dream Utah home, Perry Homes Utah is a name you can trust. We’ve been in the heritage home builder business for over 40 years, and we pride ourselves in constructing incredible two-story and rambler homes at affordable prices. Our models are crafted to accommodate every American family’s needs. Some designs can even be improved by adding several interior or exterior options. Additionally, our house buying process is seamless and stress-free, so you won’t have any trouble choosing a floor plan. For more information on our two-story and rambler homes, contact Perry Homes Utah today. Our design center personnel will gladly walk you through each of our two-story models, as well as the list of their customization options. We can also advise you on which interior and exterior upgrades to get to give you the most bang for your buck. Plus, we offer several financing options to give you the financial support and security you need to build your dream Utah home. For more information on our services, please give us a call at 801-264-8800.